I have to confess that I am a bit of a novice when it comes to cosy mystery/romance but I was attracted to this novel by the idea of a gay male romance written by a woman. 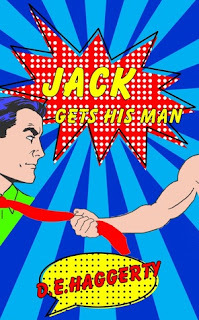 Jack Gets His Man is the spin off sequel to Murder, Mystery & Dating Mayhem and, although there are lots of references to what’s gone before, it works very well as a standalone. With Jack Gets His Man, D. E. Haggerty has indeed created a cosy world, where everything is more or less perfect. 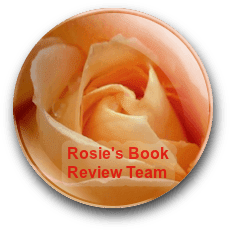 Jack is best friends with newlyweds Izzy and Noel, who are so supportive that Izzy even comes to collect him in the early hours of the morning after an illicit hook-up with an ex-lover. Jack is constantly popping around to Izzy’s house and not even the fact that he caught her and Noel in flagrante delicto can deter him. The plot develops as Jack realises that money is being embezzled from his shop – a cross dressing/plus size ladies wear store called ‘Fabulous Darling’. Izzy, Noel and a geriatric knitting club band together in order to investigate who is siphoning off the money. They are eventually joined by Damien, Jack’s recently appointed bookkeeper and love interest. The key to enjoying this novel is to suspend all reality and just go with the flow. The story is set in a small town in Oklahoma, where it seems anything goes. Criminals aren’t all that dangerous and drop dead gorgeous gay men abound, with barely a whiff of homophobia anywhere. That said there is something delightfully addictive once you allow yourself to get caught up in the mad-cap shenanigans of Jack’s life and, I literally couldn’t put the book down, reading it in one sitting. Jack is the product of the constraints that the ‘cosy’ style dictates. He is stereotypically camp, playful and of course impossibly good looking. He is shallow to the point that he defines everyone he meets by how attractive they are but he is a devoted friend and takes good care of the knitting club ladies. There are hints of darker tones when Haggerty lets us know that Jack’s family disowned him for being gay and when we see him struggling to come to terms with his upcoming fortieth birthday but, in keeping with the light, frothy style, these issues are never really pursued. I really like the fact that Haggerty uses her novel to give older people a voice. The knitting club ladies are hilarious - quick witted, saucy and not to be messed with. Despite being a great grandmother, Rose, a former accountant, is able to trace the missing money trail and is pivotal in solving the crime. Izzy is on the wrong side of forty and yet is a vital, fun loving character. Haggerty is able to effectively show how age is irrelevant when it comes to engaging with and enjoying a story. Jack Gets His Man is the perfect antidote to the stresses of real life, offering an alternate reality in the style of a fun sit-com. It would make the ideal beach read and any reader wishing to while away a couple of hours with a funny, entertaining romp, can’t go wrong with this one. A fun sounding read, thanks for the review.